There are some free computer operating systems (OS) that you must check out by yourself! Below is the list of best and top most popular open source free operating systems you maybe never realized existed! You may forget your Windows, Linux or MacOS, when you try these alternative operating systems. One of the most popular and successful open-source software is the free GNU/ Linux operating system, an open-source Unix-like operating system, and its derivative OS like: Android, a famous operating system for mobile and other smart device. Need a free computer operating system? Most of the open source OS are made freely open to all, that means anyone can get the source code, and make desirable changes to these operating system softwares as per their requirements. Below find the most used top operating systems based on open source projects, and distributed for free along with the source code, that you may also get your copy to use on your favorite computing devices. The Ubuntu is a free open source software for operating system, running from our desktop, to the cloud, to all our Internet kind of things. One of the world’s most popular operating system across different computing technology. Made to offer the fastest way to go from development to production in IoT. The number one platform for containers. This fast, secure and simple, free OS powers millions of PCs worldwide. The FreeBSD is another advanced, free computer operating system, that powers many modern servers, desktops, and embedded platforms. A large FreeBSD community has continually developed it for more than 30 years. Made with advanced networking, security, and storage features, making it the platform of choice for many of the busiest websites and most pervasive embedded networking and storage devices. You’re just a click away from discovering a new alternative! 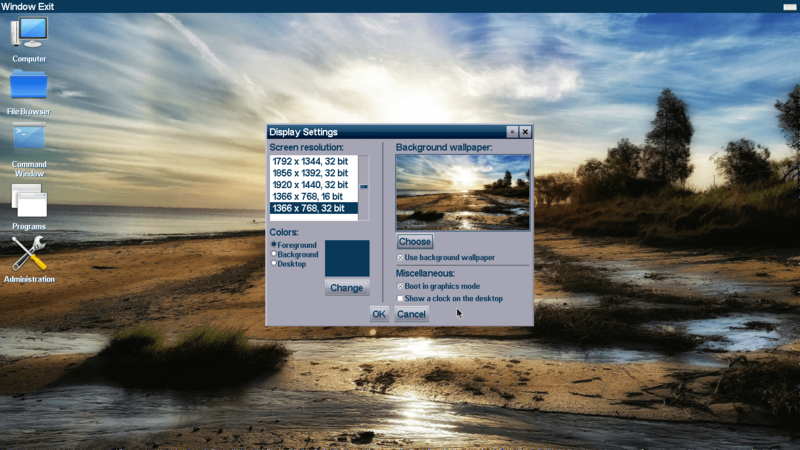 ReactOS is a free, community-based, open-source, collaborative and compatible operating system. Now imagine running your favorite Windows apps and drivers in an open-source environment you can trust. It’s ReactOS. an open source but also a free operating system. Lightweight, not Linux mimicking Windows, contributed along the years. FreeDOS, is a complete, free, DOS-compatible operating system, that you can use to play classic DOS games, run legacy business software, or develop embedded systems. Any program that works on MS-DOS could also run on it, that does not cost anything to download and use! You can view and edit the source code, because it is distributed under the GNU or a similar open source software license. Haiku is another open source operating system actively in development. Specifically designed for targeting personal computing. It’s a fast, efficient, simple to use, easy to learn, and yet very powerful OS for computer users of all levels. Additionally, it offers something over other open source platforms which is quite unique. Specific focus on personal computing, custom kernel designed for responsiveness with unified, cohesive interface. Syllable Desktop is another free and open source operating system specially for Pentium and compatible processors. Syllable’s purpose is to create an easy-to-use desktop operating system for the home and small office user. It has a native web browser, email client, media player, IDE, and many more applications. Another open source version of Syllable OS is the Syllable Server, which is also based on Linux core. The AROS Research Operating System is another light-weight, efficient, and most flexible desktop operating system, specifically designed to help you make the most of out of your computer. It’s an independent, fully portable and free project, aiming at being compatible with AmigaOS at the API level, while improving on it in many areas. Source code under an open source license, and anyone can freely improve upon it. MenuetOS is a real-time, pre-emptive, and multi-processor Operating System in development for the PC written entirely in 32/ 64 bit assembling languages. Menuet64 is released under License and Menuet32 under the GPL License. It supports 32/ 64 bit x86 assembly programming for smaller, faster and less resource hungry applications. It isn’t based on other OS nor has it roots within UNIX or the POSIX standards. DexOS is a 32-bit operating system written in x86 assembly, specially designed for the coders that want direct access to all hardware, including CPU and graphics, with well-commented code and documentation. It’s licensed under a free to use license for commercial and non-commercial uses. It is written and maintained by Craig Bamford and other voluntary developers from around the world. Visopsys is another alternative free operating system for PC compatible computers. This system is small, fast, and open source. It features a simple but functional graphical interface, virtual memory, and pre-emptive multitasking. Though it attempts to be compatible in a number of ways, it’s not a clone of any other operating system. A 100% protected mode open source, free software for computers. Minoca OS is another free, general purpose operating system based-on open source project, written from scratch. It aims to be lean, maintainable, modular, and compatible with existing software. It features a POSIX-like interface towards application software and a growing suite of popular packages already built and ready to go. On the back-end, it contains a powerful driver model between device drivers and the kernel. NetBSD is also an open source, secure, and highly portable, Unix-like free operating system. Available for a wide range of platforms, from large-scale servers and powerful desktops to hand-held and embedded devices. Its clean design and advanced features make it excellent for use in both production and research environments, and the source code is freely available under a business-friendly license. The OpenBSD project produces a free, multi-platform, UNIX-like operating system. Their efforts emphasize portability, standardization, correctness, proactive security and integrated cryptography. As an example of the effect it has, the popular OpenSSH software comes from it. OpenBSD is freely available from our download sites. OpenBSD is developed entirely by volunteers. The illumos project, is an open source fork of Sun’s OpenSolaris. Launched in 2010, the project enjoys financial and technical support from several key companies which rely on the illumos kernel as the technological foundation for their own products, as well as the backing of a growing developer community. These top open source free operating systems are developed as a public collaboration, and made freely available for use or modification, as users or other developer’s own version. If you too, thinking about trying free OS, besides Windows, Linux, or MacOS, then you are free to try! Got any recommendation for another open source free operating system? Please let me know via the comment section below.